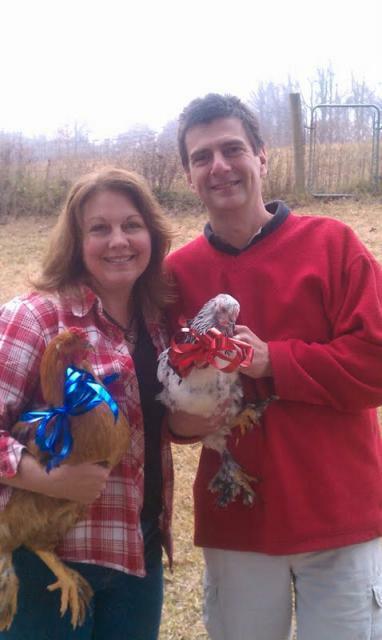 This is our coop remodeling story. Here is the finished (are coops ever really finished?) product. 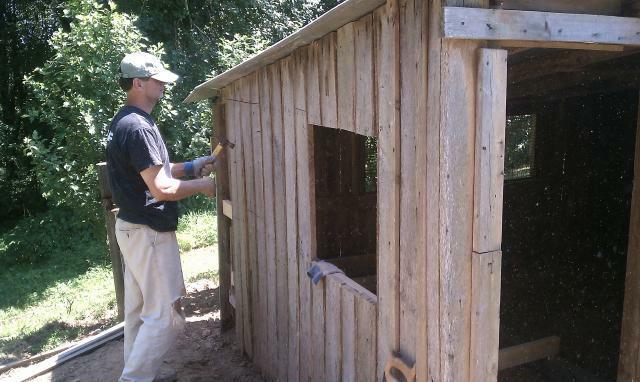 We started with an old 8' x 16' shed used as a chicken and/or dog house by previous owners (below), but now falling in and unstable. The 'door' wouldn't open. Boards were rotting and falling off. There were multiple bees' nests to deal with. Weeds were overgrown in the fenced area. 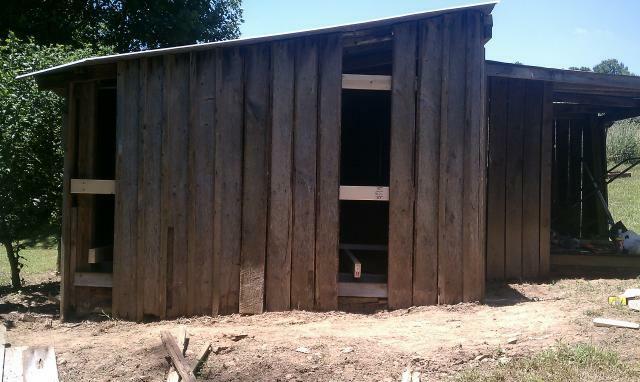 There was only a dirt floor, no roosting poles, and one window covered with broken, rusted chicken wire on far side. It was dark inside. 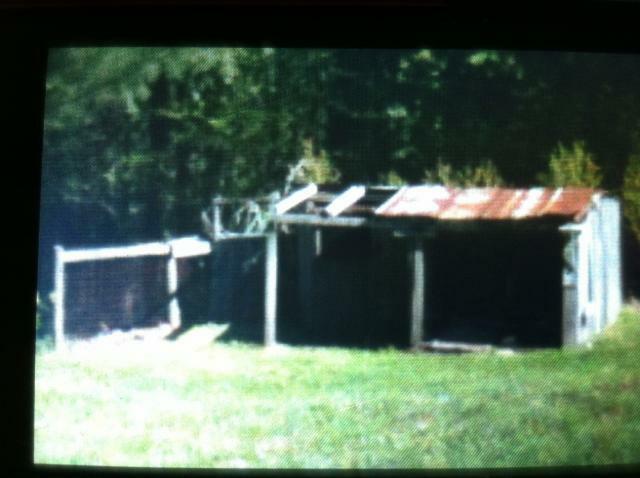 Here is another picture of it the first time we saw it! 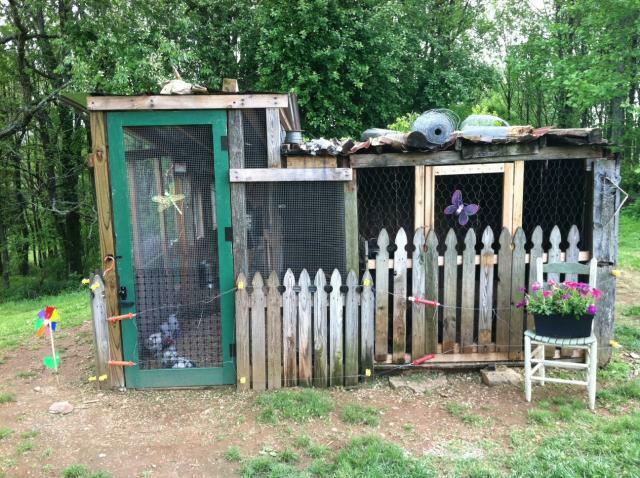 We liked the idea of double windows in the front, egg box underneath, and a people door on the side. Here is the step by step progression of how we did our Country Club makeover. First, my fiance' tore out lots of the old stuff! And then we began to cut out for the front windows so we could have enough light to see to work on the inside too. Those old oak barn boards are a bear to cut and nail!!! Seems they bent about every 9 nails out of 10! Notice that the door drags the ground and is terribly crooked, so much so that we debated for days as to whether to trash and burn it and then rebuild it completely, or to salvage it, and level it up, etc. We chose the latter, but have often wondered if that was a mistake because it took an entire day to salvage it. Here you can see the setting and why I did so much work to predator proof it! Meanwhile, the race was on! 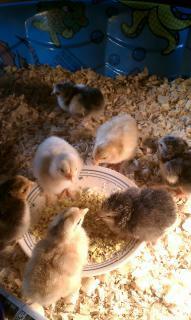 We started rehabbing when I placed the eggs in the incubator. 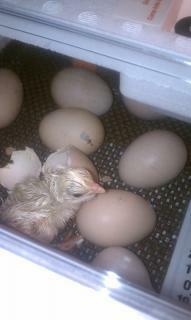 I kept saying to myself, oh well, no problem, we have THREE LONG WEEKS to complete this before they even hatch. ha. We had NO idea it would end up taking us months to complete this! In the people house, here's what was happening...rapidly! 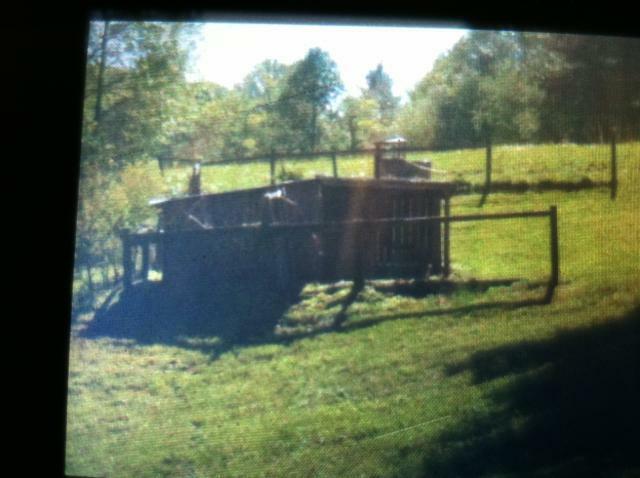 The building is about 8' x 16', and was not remotely level or square and also VERY short! It was only about 5.5 feet tall at the highest point. 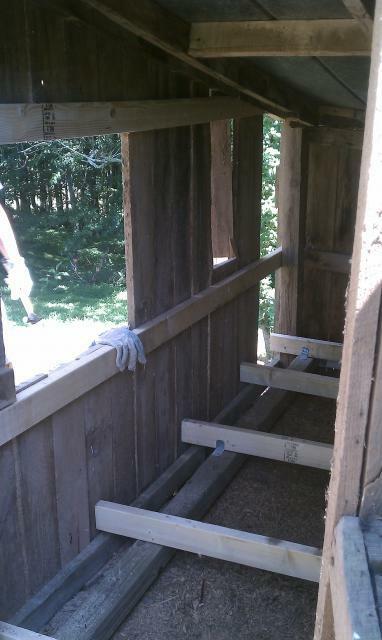 Adding a floor made the inside only about 4.5' tall. It was back breaking to add the floor and a partition wall, but we did and now the floor space is 4' x 8'. Below we were framing in for the windows which also accomplished strengthening entire front of the building and gave us something to re-nail the oak boards to, which were previously falling off. We cut out the rotten areas and replaced with stronger, original boards as we worked our way across the front of the building....board by board. We found two perfect sized windows in another old building on the premises. Gotta love freebies! Below, we started to see some progress finally! It was starting to look like our vision! It was so exciting to get to this stage! We opted to saw off about a foot of the door, leveled it up the best we could - considering- and reinforced it from the inside because it was also falling apart and rotten across the bottom. It now opens at the level of the new floor we built, and is also more predator-proof than before. This was nearly a month of work! 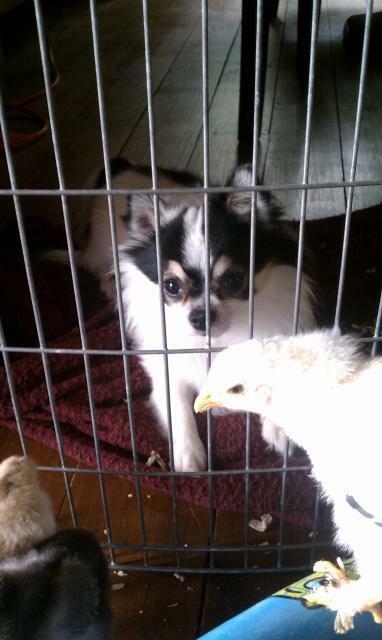 With the floor finally complete, and the partition wall almost done, here was what was happening with my ever growing chicks who were living it up in the people house, with Carlos, our chihuahua, babysitting! 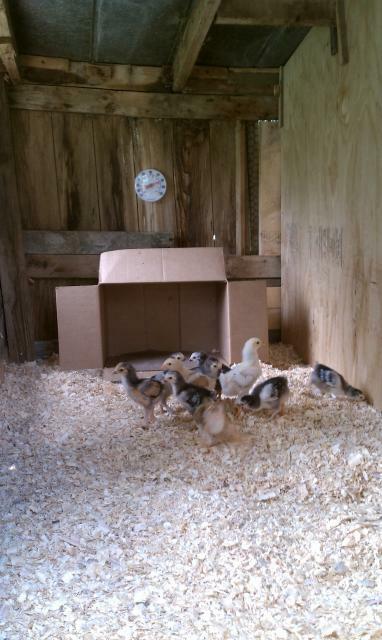 Finally the day came that we felt the coop, while not complete, was safe enough to move the baby chicks into their own house. 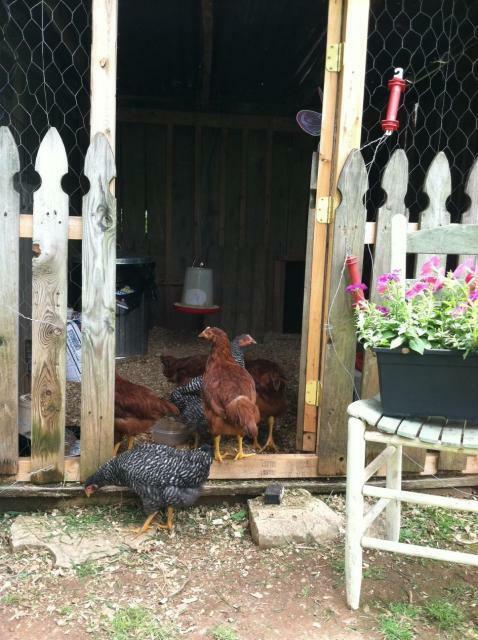 (Since this picture was taken, we have added a 2"x4" across the back corner for a roosting pole and brooder lamps for warmth and light in winter. 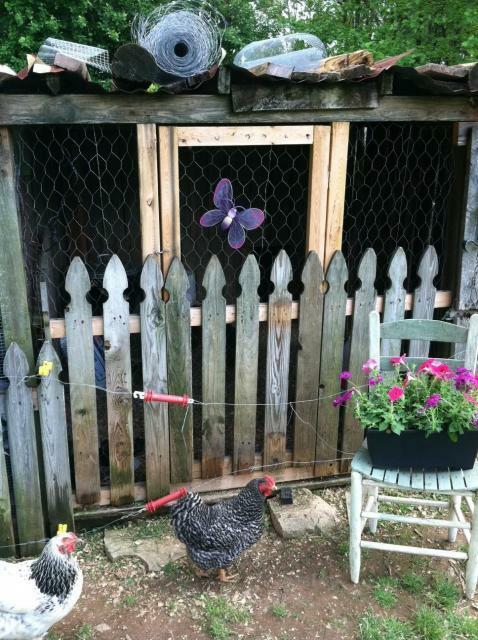 This winter I wrapped the roosting pole in an old quilt so their feet would stay warmer -- and they loved it!). 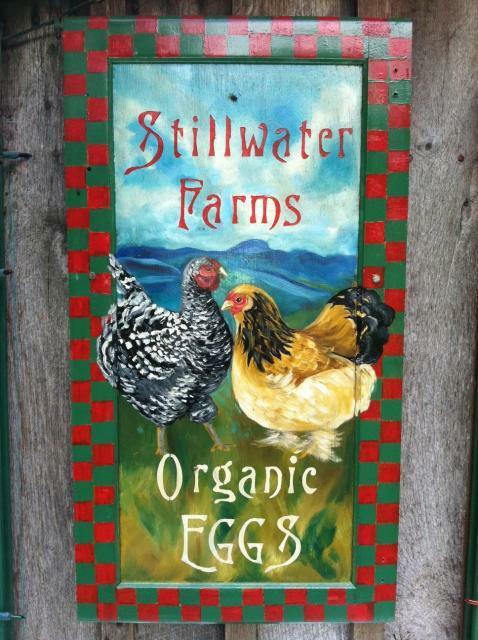 Welcome Home, Stillwater Chicks, Welcome Home! 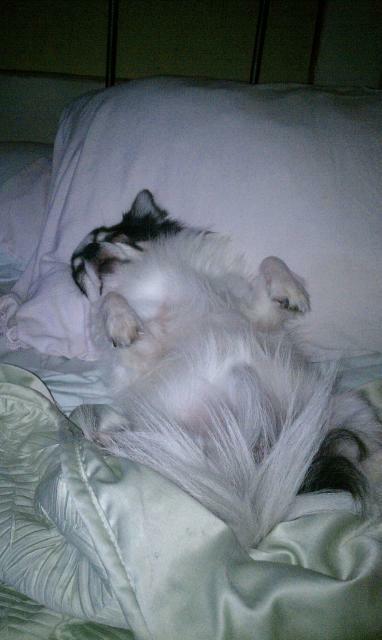 And while we were working day after day in 90 degree plus heat and humidity, look who was sleeping in the the bed in the air conditioning! 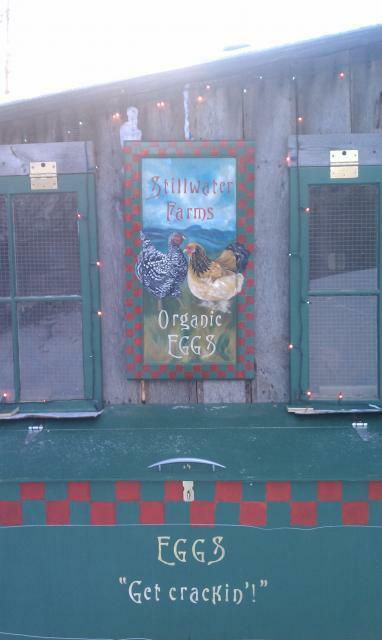 I hand-painted a sign for my coop using an old cabinet door and my oil paints. 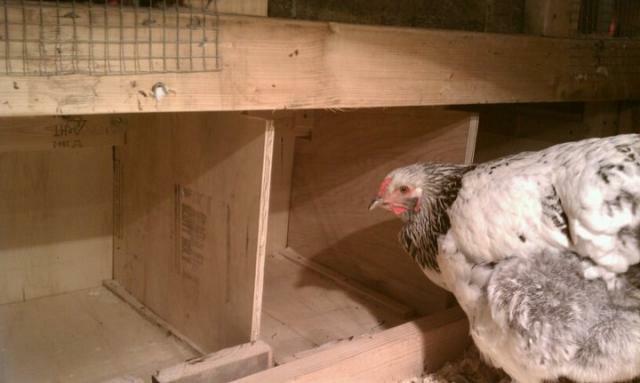 We got that egg box installed in the nick of time, because about a week later, the girls laid their FIRST EGG!!! Surprisingly (or not) one of the most exciting moments of my life! I eventually blew out the inside and kept the shell, now one of my prized possessions! You'd think that would be the end of the story...but as they say 'necessity is the mother of invention'. These guys below made me rethink using the unused portion of this old building when they hit puberty! 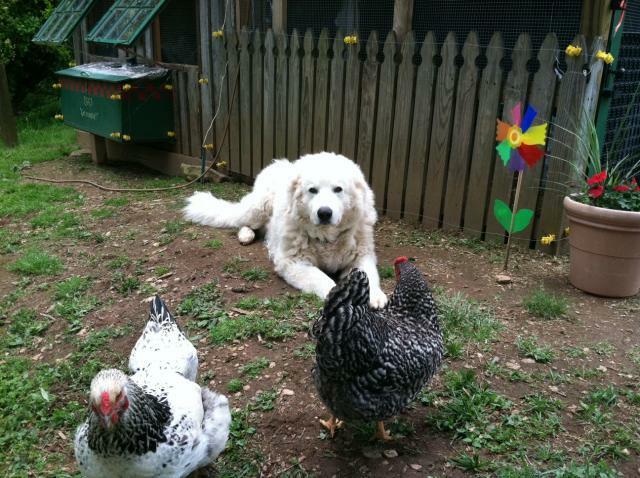 They became very impolite with the ladies, and much to my naive surprise, started to act like, well, ROOSTERS! 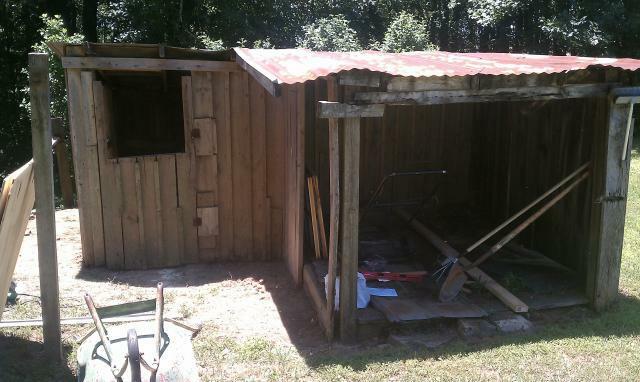 So, I added a second patio, propped up roof that was previously falling in, and made a 'Bachelor's Pad"for them. They weren't impressed. 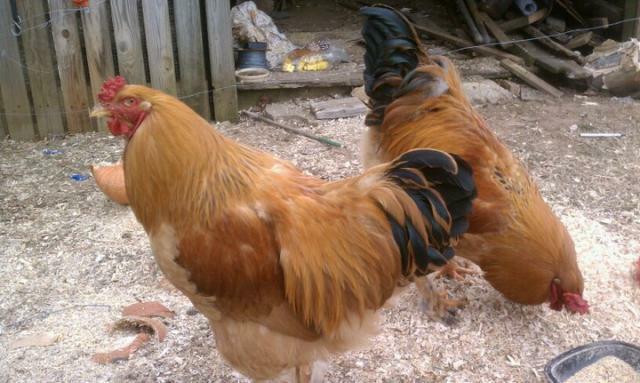 Eventually these 'bachelors' went to live with a wonderful family who wants to raise Buff Brahmas, and now the extra section is being inhabited by my newest addition shown below, 4 Rhode Island Reds, and 2 Plymouth Barred Rocks. 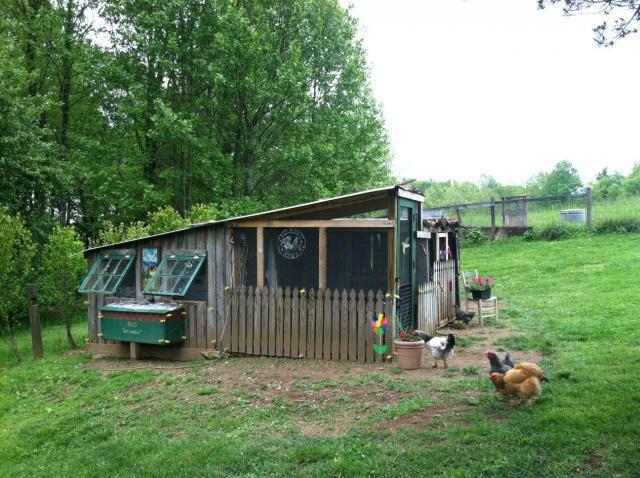 They just have a dirt floor, and no fancy accomodations like the first chickies got (who I might add are VERY spoiled girls who still think they should live in the people house and not the chicken house), but they seem very happy just the same. 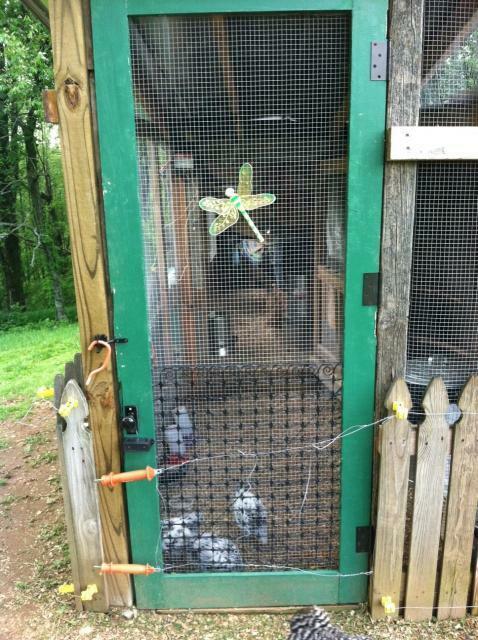 On this section, I used chicken wire that I already had, but at some point I will replace it with hardware cloth to make it less inviting to predators. Here's the back. The roof is iffy, and leaks in heavy rain. That's something we've got to deal with soon. We've got lumber on it to weight it down to keep the wind from blowing it off! 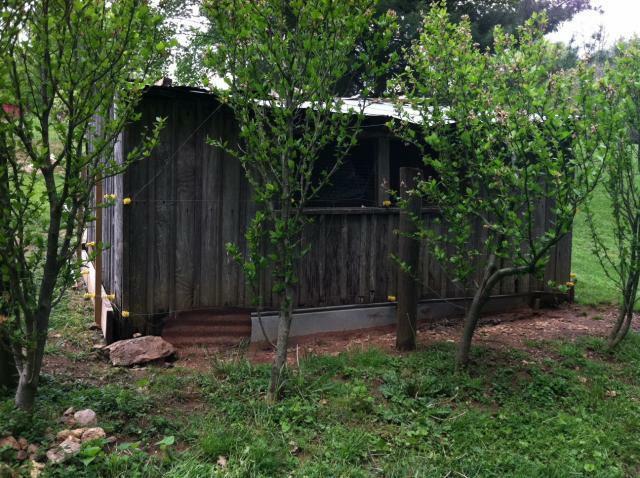 But, all in all, the chickens are very happy, and we're relieved that the coop is done, it works well, keeps them safe and relatively warm! 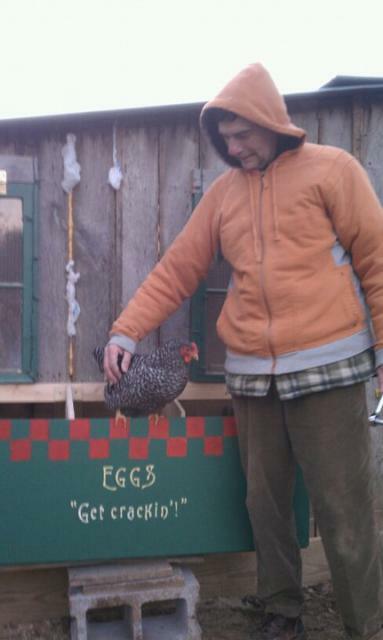 I love how unique our coop turned out, we are proud of it. 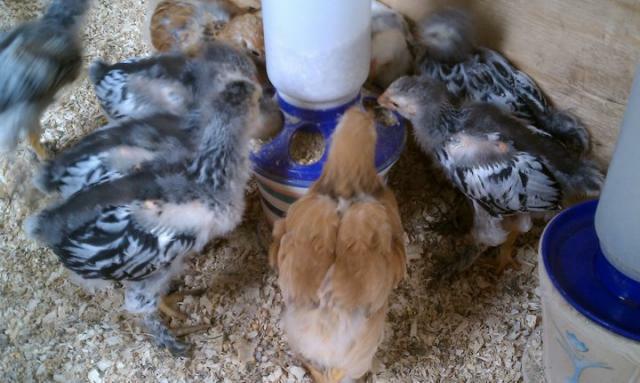 I have had only one predator incident which happened when my first chicks were only 8 weeks old. They were attacked by a very large hawk. 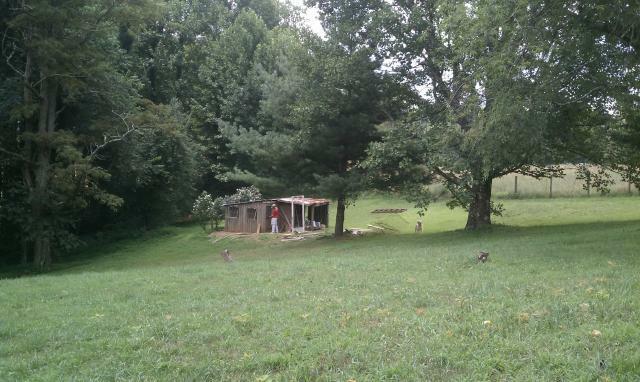 Luckily I was able to startle the hawk which dropped one of my only two Brahma pullets to the ground from a height of about six feet. She was limp, and bleeding, and I thought she was dead. 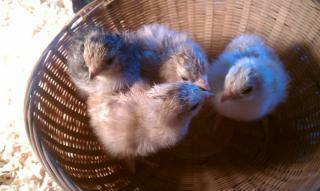 The other chicks were terrified. The hawk sat in a tree very nearby and watched me, completely undeterred by my presence, while I frantically rounded all the chicks back into their coop, and ran to the house with "Eagle". After a few minutes, still limp, she started to open her eyes. I kept telling her, "Eagles are stronger than hawks." She must have believed it because she made a full recovery in about a week! 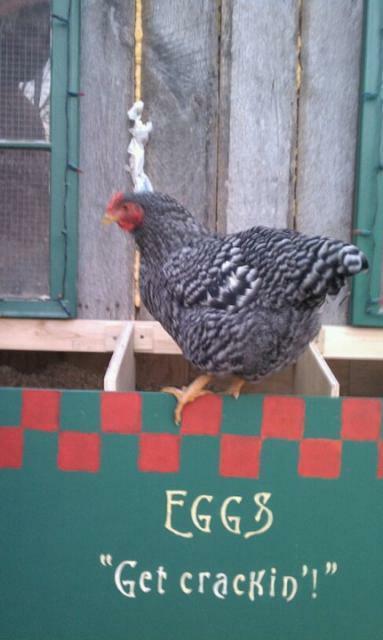 She suffered a broken tail that still interferes with her ability to balance, run and jump as well as the other chickens, but all in all, she's now a happy (and fat!) girl. Here she is below with my other two from my first hatch! 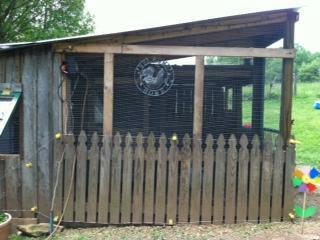 We added these roosting poles on the front patio area. 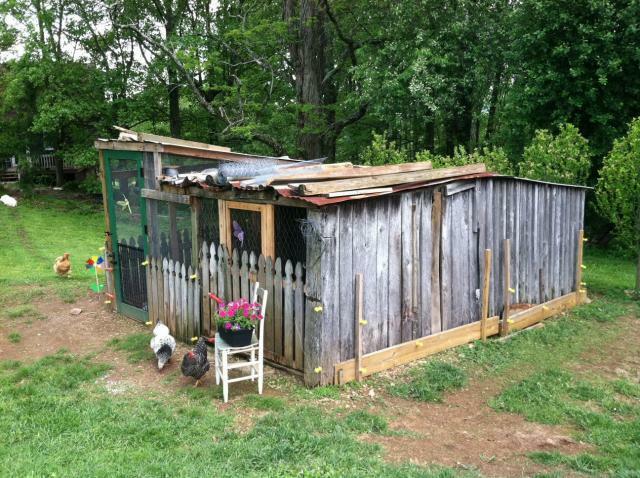 If I had it to do over again, maybe I would have just bought that pretty little red coop I found on the side of the road! 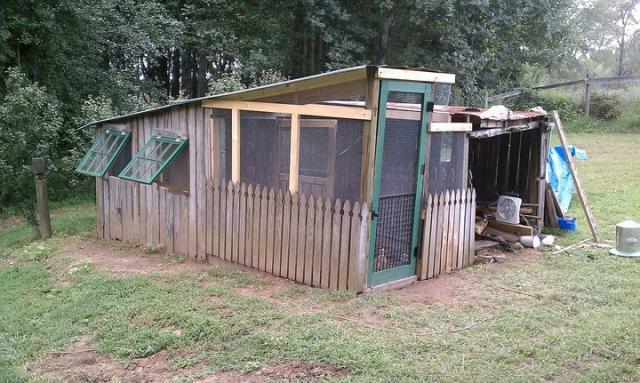 After it was all said and done, the cost of this extreme makeover for this old difficult building was nearly the same price as the brand new coop including delivery, not to mention it was SO MUCH WORK!! Way more than we ever anticipated. It is, however, very rewarding to look at it now. It did not save us any money in the long run whatsoever. Good thing I wasn't going into this venture to 'save' money! On the flip side, I love how it came together piece by piece, and how unique it turned out, and I enjoy the artistic touches we added. Truth is, you just can't buy something like this....and would you want to?! BUT, here are the final results! This makes me happy every single day and it's impossible to put a price on happiness! 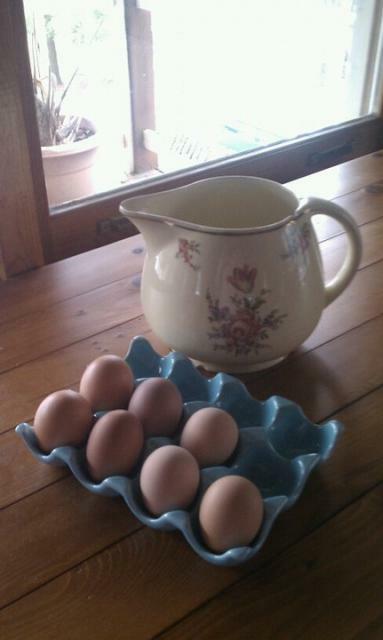 My amazing organic, soy-free, truly free-range EGGS!!! And they all lived happily, ever after! 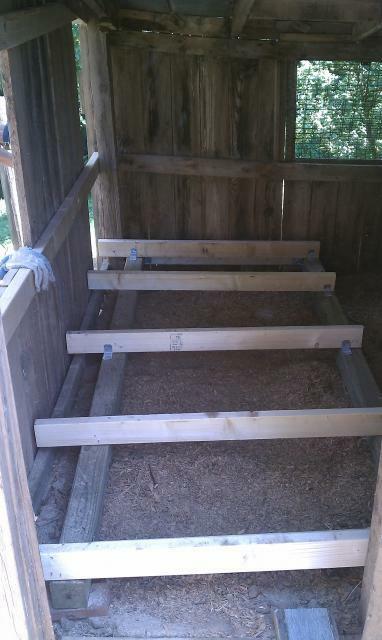 Loved your story and progression photos of building your coop. 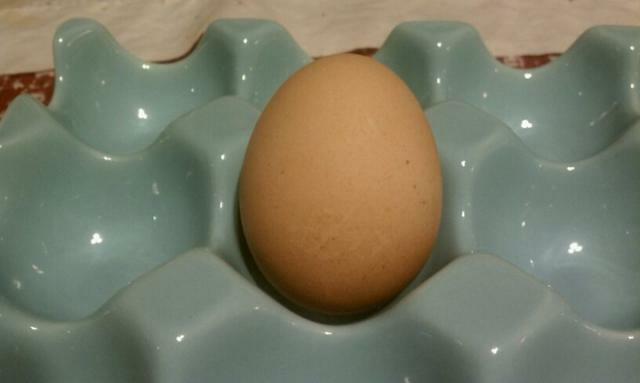 Your coop is very beautiful. Love the paintings. Love the colors. Nice job! 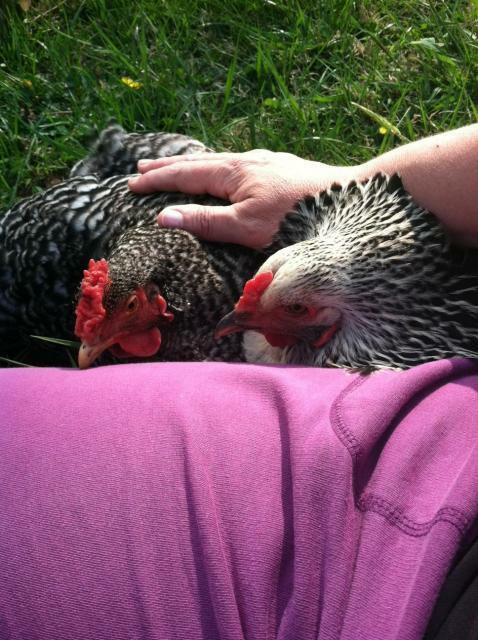 Chickens are pretty, too! Thank you for sharing! All the pictures and explanation make this a great article. Yall did a great job! Looks good. Fabulous job and beautiful sign. So talented ! So cute!! Oh and I LOVE the name Tiny Dancer!!!!!!! 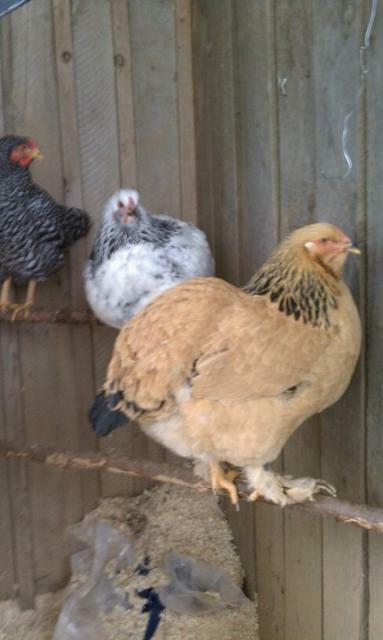 I have a tiny buff brahma who is less than half the size of the other two I have the same age. Tiny Dancer would have been the perfect name for her. 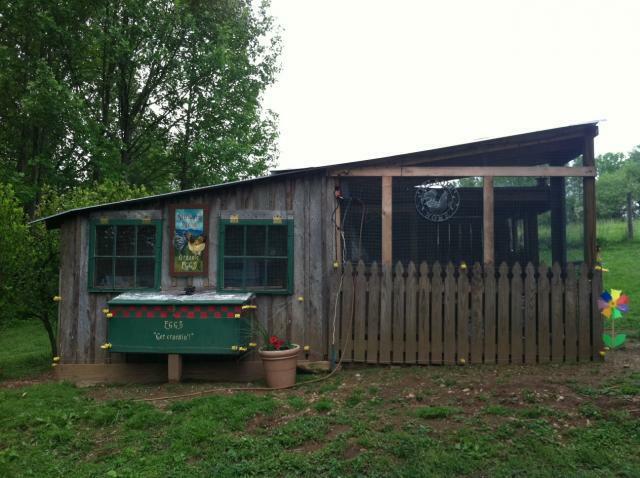 The coop has so much rustic charm! 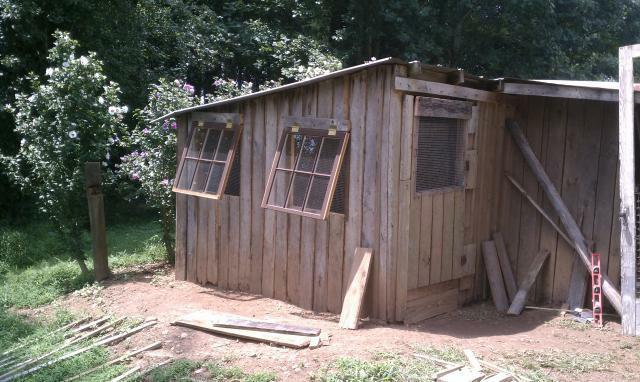 An inspiration to get our coop finished! Nearly there, but we are flagging... I love the rustic, beautiful look. Charming coop, love your hand painted sign! 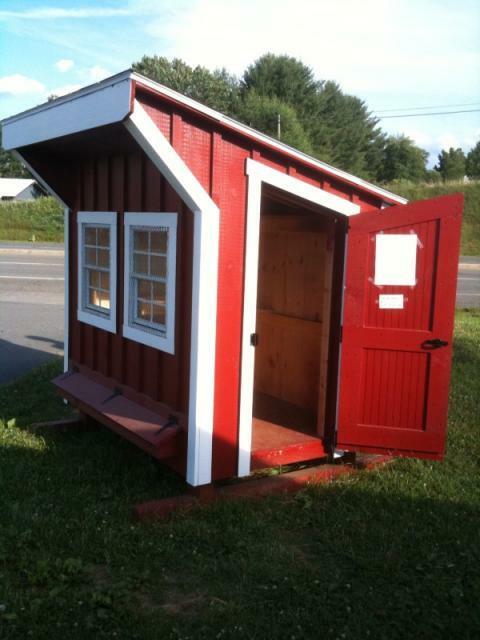 If you had bought the "litte red coop", it would be just a coop. The one you have now, is YOUR creation and I'm sure your birds appreciate it. 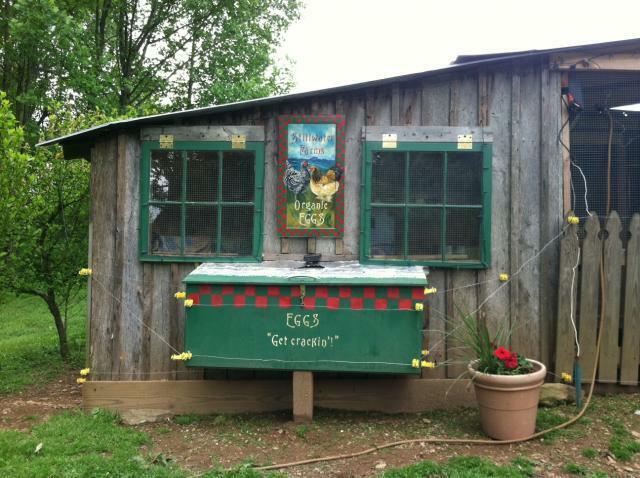 Love the hand painted sign and the picket fence section. 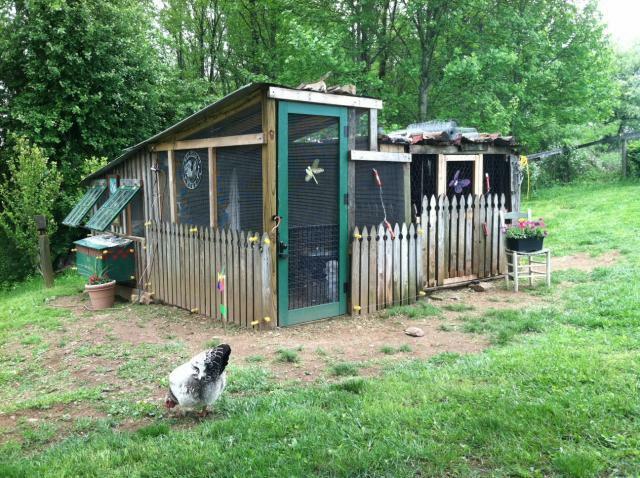 Such a cute little coop. Great job! wow you are a great painter!!! 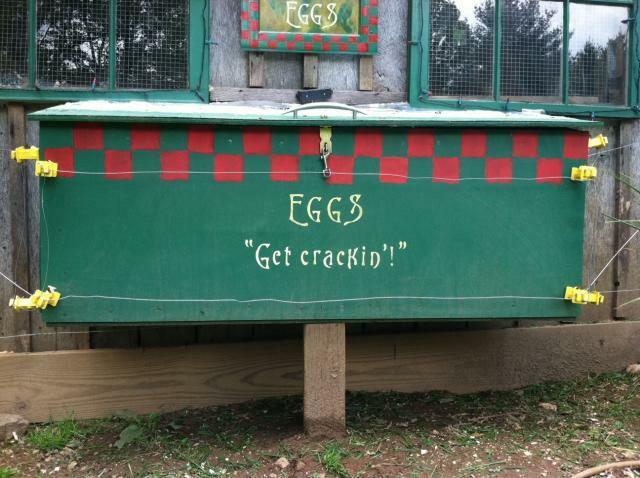 !you should try and paint the eggs. Your coop is amazing! I love the artistic touches...it has a lot of character! You have some lucky girls...good job!